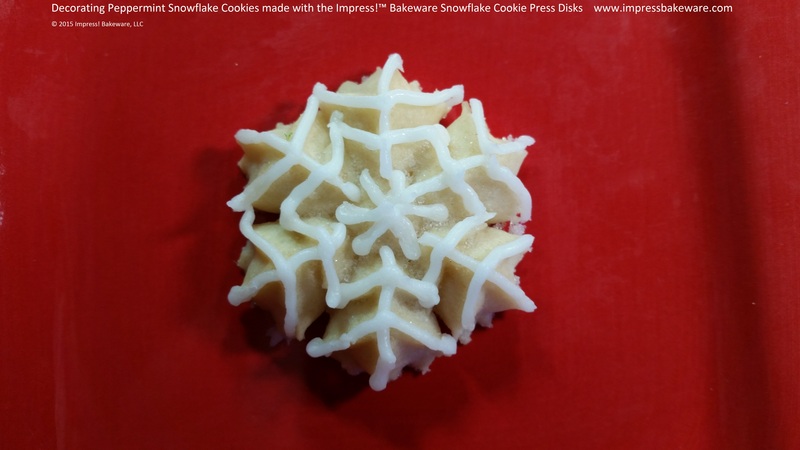 Let the snow fall and the holiday baking begin! 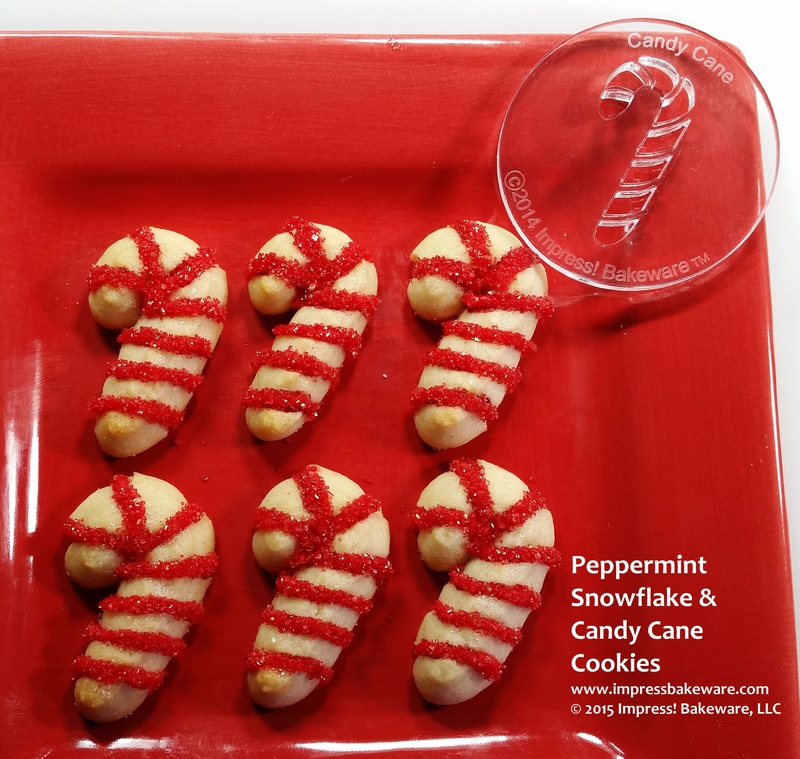 Sweet peppermint candy canes are a favorite flavor of the season, so I took inspiration from their yummy minty-ness. 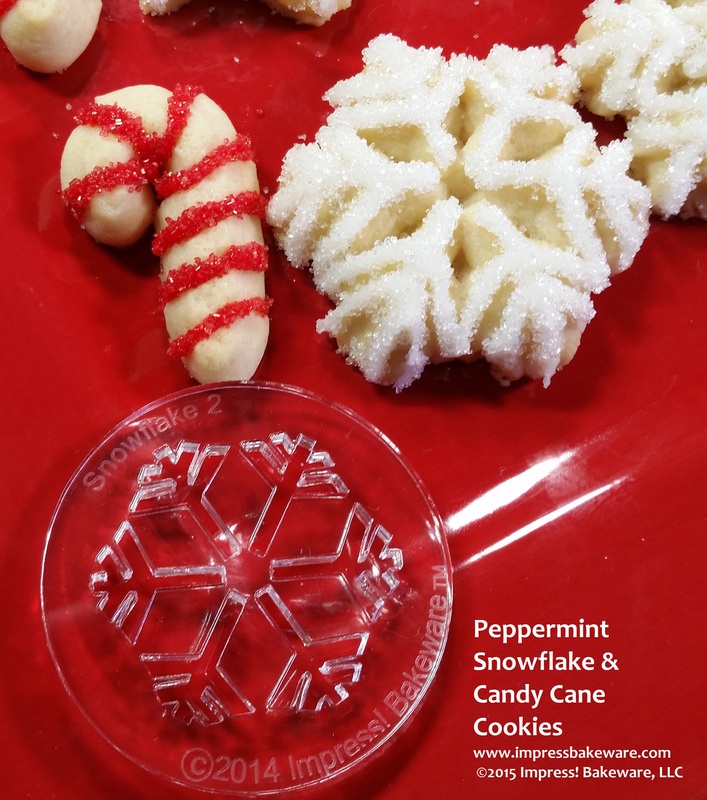 I came up with a delightful peppermint spritz cookie recipe I can’t get enough of. The creamy buttery-ness and cool mint flavors combine deliciously in these easy and beautiful little cookies. 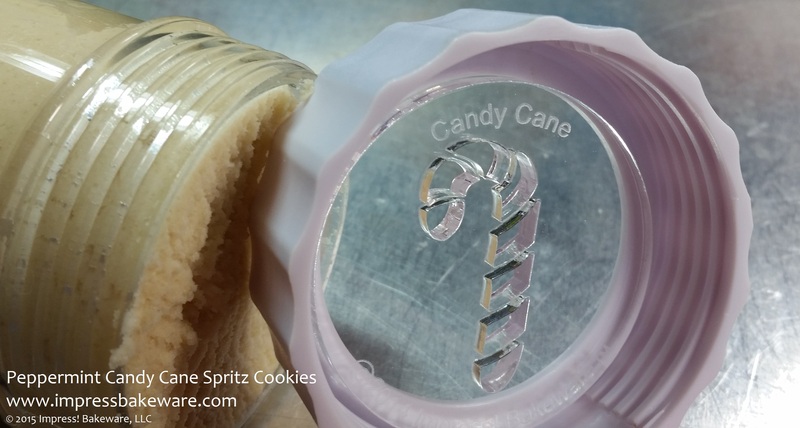 Your whole house will smell like candy canes as you bake! As I often do, I used my basic spritz recipe as a base. I played around until I found just the right mix of vanilla and mint extracts so that the mint came through strong but blended nicely with the butter cookie. The result was better than I had even hoped, and I hope all of you enjoy them as much as my family did! Red and white sanding sugars, granulated sugar, and red and white decorating icing for decorating. 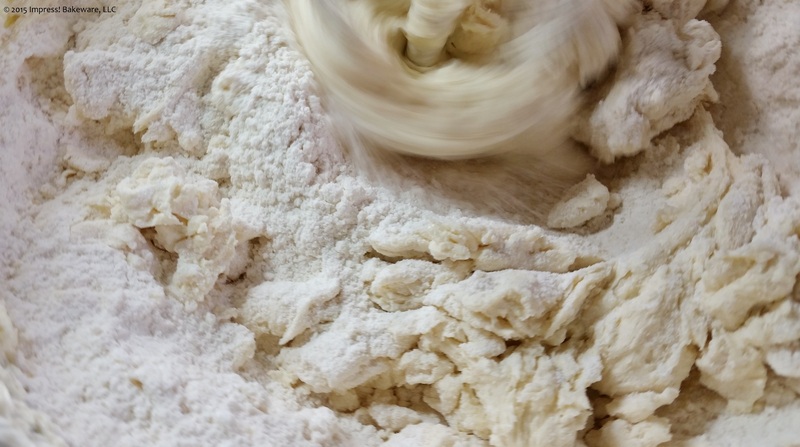 In a large bowl, combine flour, baking powder, and salt. Set aside. 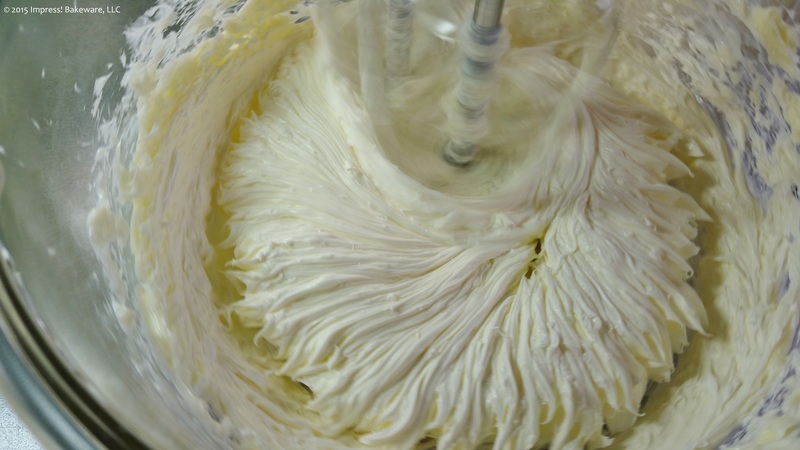 Using an electric mixer, cream the butter very well. 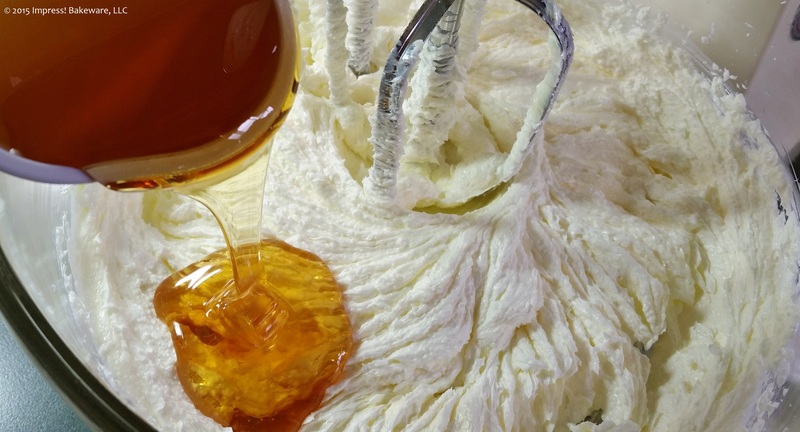 Creaming your butter extremely well until it is smooth and literally creamy is the key to great spritz cookies. I like to pretend I’m making frosting and use the “whip” setting. Add the sugar, then the honey, then the extracts and egg, re-creaming the mixture after each new addition. Next add the flour mixture slowly, mixing on a slow speed until a soft dough forms. 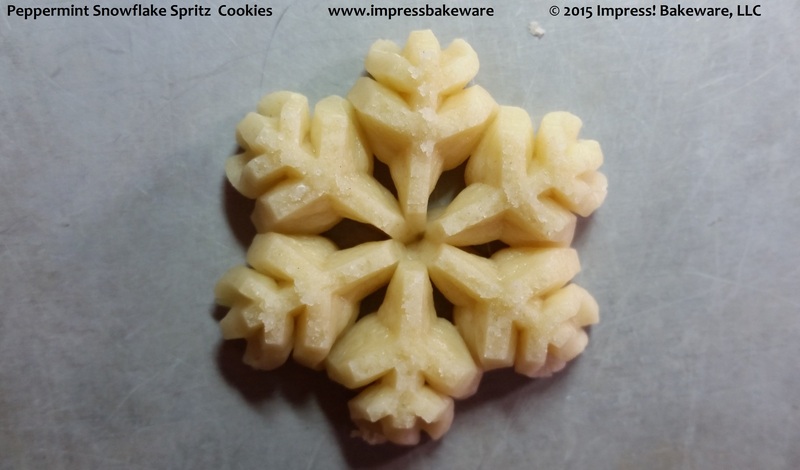 Perfect spritz dough has a slightly stiff texture that is not too sticky. Pack your dough into your cookie press barrel, using the back of a spoon to press all the air bubbles out. This helps create consistent pressure to press with. Place the disk in the bottom ring and start pressing onto an ungreased cookie sheet. Use a consistent rhythm to keep the shapes a uniform size. 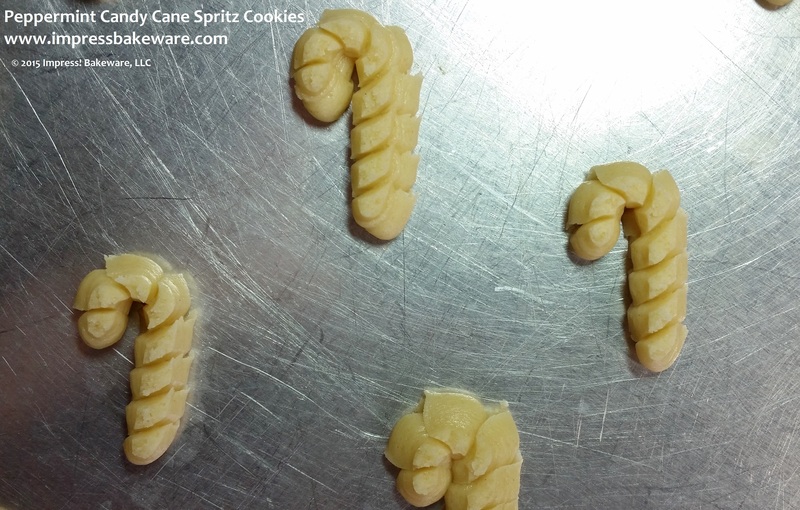 For the candy canes especially, you may find that pressing less than one full “click” (if you have a one-click-per-cookie type press) creates a better shape. The candy canes are prettier if they are small and thin. It is also true for the snowflakes. For the most delicate shapes with the most detail, press small, well-defined cookies. Sometimes this will mean less than one click per cookie. Just experiment and you will get the hang of it! If some come out wrong, just toss them back in the bowl to be re-pressed. 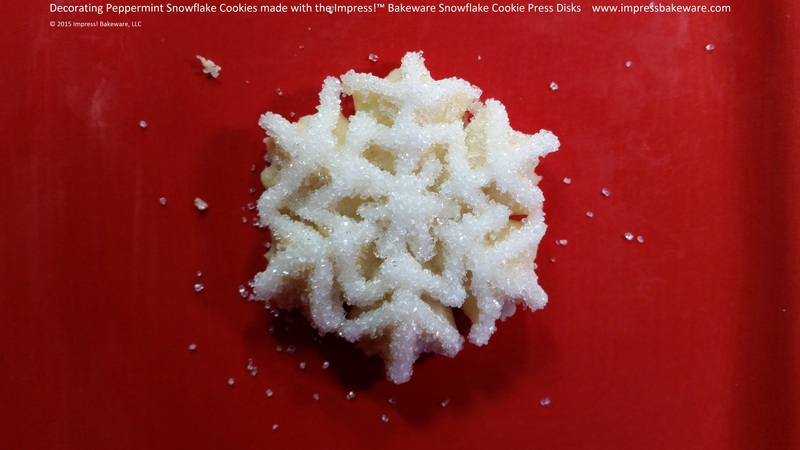 The easiest way to decorate the snowflakes is simply to sprinkle them with white sanding sugars. You can also use plain granulated sugar. Its very fine texture melts in well and allows the details to show through nicely after baking. Bake the cookies for 7-9 minutes, checking early as all ovens are different. 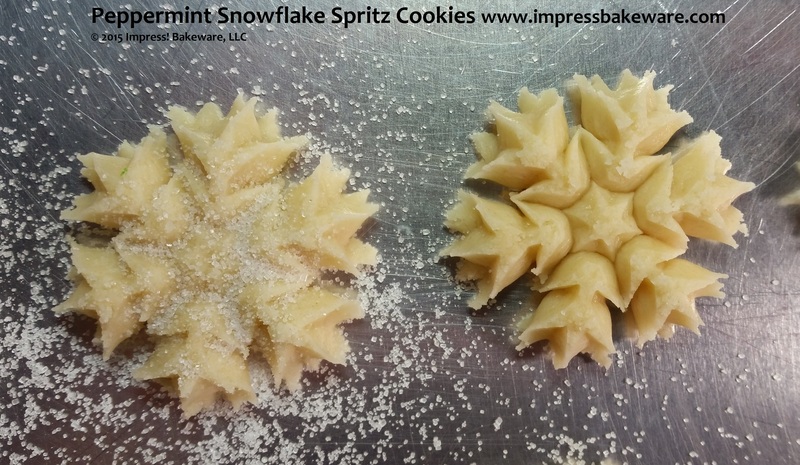 Spritz cookies are done when they just begin to slightly brown at the edges. To maintain their delicate texture, do not over bake! Let them sit for about two minutes then remove with a thin spatula, keeping it very flat so as not to break the cookies. You can leave the snowflakes plain, or you can decorate them further with icing and sparkling sanding sugars. 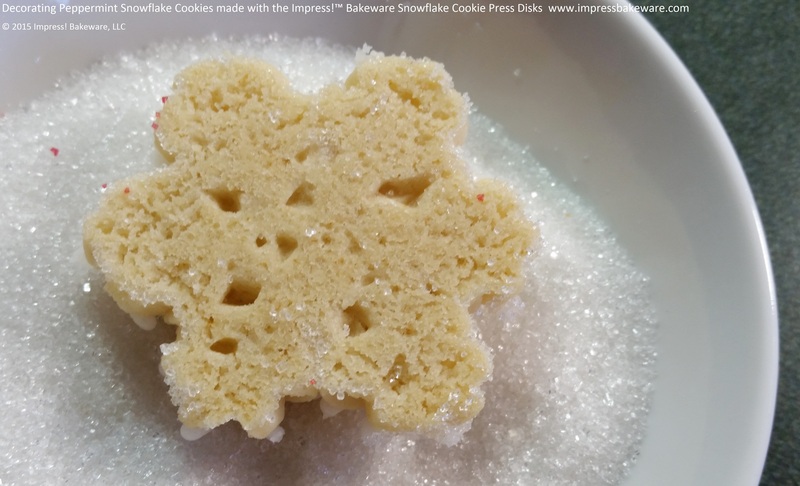 Trace the contours of the snowflakes with white icing (decorating icing is best) and then turn them upside-down into the sanding sugars, gently coating all icing. Do not press too hard. 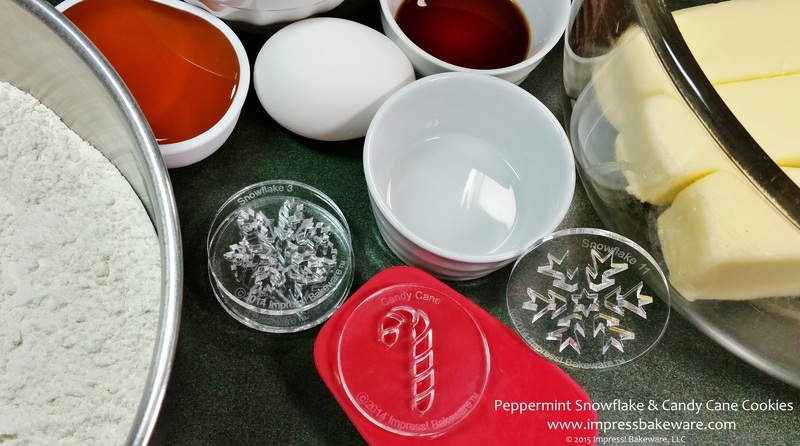 This simple technique is also a great way to decorate the candy canes. 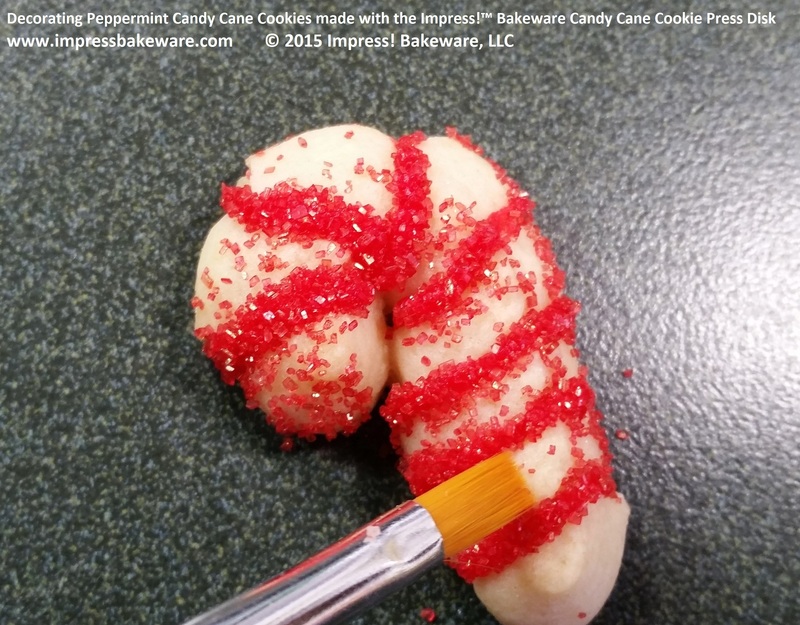 Use the grooves in the cookies as a guide to apply stripes of red icing. Then dip the cookies in sanding sugars and use a small decorating brush to remove the excess. 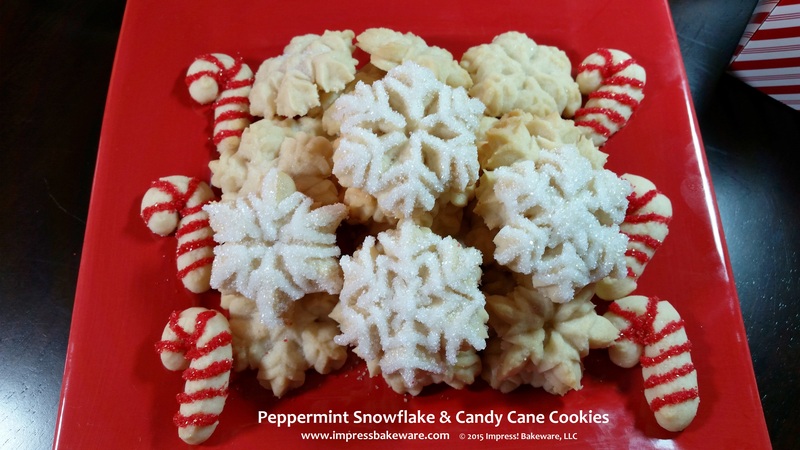 Peppermint Snowflake & Candy Cane Cookies. Enjoy! If you’d like to see more disks, be sure to check out www.impressbakeware.com for over 200 disk designs and many more recipes and ways to use a cookie press. You can press icing decorations on cupcakes, make chocolate truffles, crackers, peanut butter spreads, pumpkin mousse parfaits, and much more. Hi Susan! Most grocery stores carry tubes of glittery gel icing in their baking sections. Actually, since I didn’t use glitter icing in this blog I want to be sure I’m answering your question correctly! Are you asking about glitter gel icing, or sparkling sugars? I want to give you the most helpful answer I can.